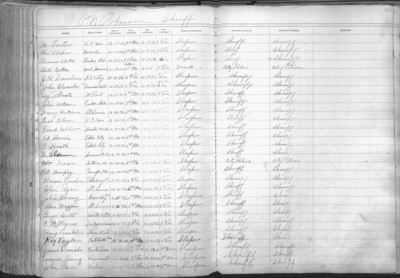 Handwritten daily jail register on lined ledger paper from the Crawford County, Kansas, Sheriff's Department, from the period of March 1, 1922 to September 1, 1935. DONOR INFORMATION The Sheriff's Department, Crawford County, Kansas, Daily Jail Ledger, 1922-1935 was donated to the Leonard H. Axe Library, Special Collections, by Sheriff Sandy Horton, Crawford County Sheriff's Department, on April 16, 2010. U.S. and international copyright laws protect this digital image. Commercial use or distribution of the image is not permitted without prior permission of the copyright holder. Please contact Special Collections, Axe Library, Pittsburg State University for permission to use the digital image.